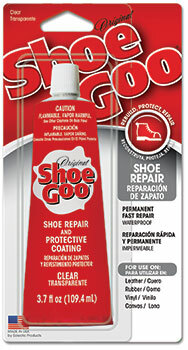 Shoe GOO is water resistant immediately upon application. Apply Shoe GOO directly to the surface to be sealed. Use thin coats of Shoe GOO to build a thick coating on the surface to be sealed, allowing each layer to set 3 to 4 hours. This is especially ideal for smooth surfaces, such as plastic, glass or ceramic. Shoe GOO hardens by solvent evaporation, so allow time for thorough hardening to ensure proper bonding and wear resistance. If a worn shoe has a hole that goes all the way through the sole, tape over the hole inside the shoe before applying Shoe GOO to the outer sole. This will help avoid creating a bump. The tape should be removed from the inside and all bumps smoothed out within 2 hours, before the glue is completely hard. Some fisherman’s waders and foul weather gear have a water-repellent coating that must be removed before Shoe GOO will adhere. Scrub the area with detergent and allow to dry. Roughen surface before applying Shoe GOO. If the bond still pulls apart, the repair must be done on the inside surface of the item, which is usually reinforced with fabric.